William will happily sign your personal items and/or photographs. 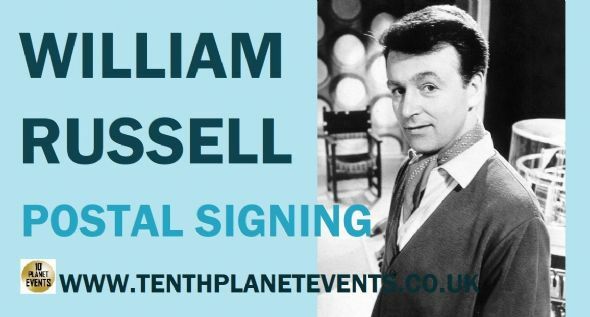 William Russell was born William Russell Enoch on 19 November 1924, in Sunderland, County Durham, England, to Eva Compston (Pile) and Alfred James Enoch. He became interested in acting at an early age. He was involved in organizing entertainments during his national service in the Royal Air Force and then, after university, went into repertory theatre. He appeared in "Hamlet" in London's West End and won a number of film roles, usually as a dashing hero. Notable TV work followed in The Adventures of Sir Lancelot(1956) for ITV and Nicholas Nickleby (1957) and David Copperfield in Tales from Dickens(1958) for the BBC, shortly after which he was cast as Ian Chesterton in Doctor Who(1963). He later continued a successful acting career, particularly in the theatre, and for a time held a senior post in the actor's union, Equity. In recent years he has been a member of the Royal Shakespeare Company.